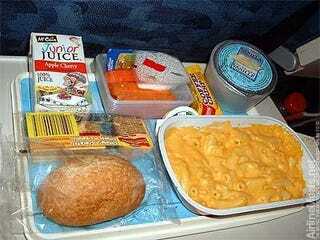 Remember when an in-flight meal was considered a guaranteed part of the flight, rather than being seen as some newfangled, exciting privilege? Remember too when every fourth joke by a stand-up comic was about how the seat-back tray was more edible than the food served on top of it? Apparently, modern airlines do not remember that golden age (HAH!) of air travel, because they're now apparently fighting each other by promoting food options. No word yet on whether they'll start competing with each other by offering "Get Out of TSA Genitalia Patdowns Free" vouchers, but hope springs eternal.